Lyralei, the Windranger, is a versatile ranged intelligence hero that can fill several different roles on a team. A long range disable couple with respectable damage output gives her the ability to play as a core hero or a support, depending on what the team might need. She is, however, typically played in the third position, as the offlaner. Her ability to farm from a relatively safe distance lends well to playing in the more difficult side lane, where she can soak up experience and gold without putting herself in significant danger in the process. 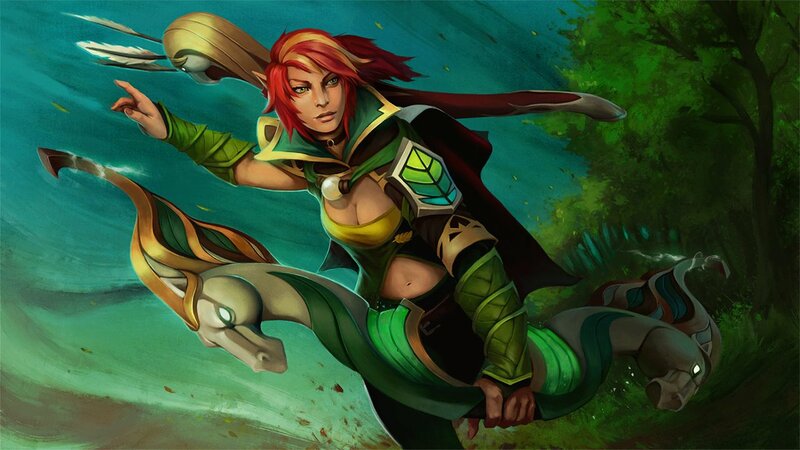 Once she is able to secure her farm, Windranger turns into a frightening semi-carry with a rapid attack in the form of Focus Fire. Windrun allows her to go toe-to-toe with opposing physical carries, followed by Shackleshot in case they survive the initial rain of arrows. Focus Fire also makes her excellent at taking objectives, thanks to it being able to target towers and structures in general. Her flexibility, however, is also her downfall; she isn’t the hardest carry in the game and there are plenty of supports that fulfill the role better than she can. She also requires a degree of mechanical skill to be effective, due to the fact that both Shackleshot and Powershot are skillshot abilities. Still, she is a worthy pick for just about any composition, and can be counted on to perform a myriad of tasks at any given moment. Much like other heroes, Windranger’s ability progression is determined mostly by the scaling of each individual ability. In her case, Windrun is normally left at a single point through the early and mid game, as its movement speed bonus is a flat 60 percent all throughout. Shackleshot and Powershot are much more important to max out first, therefore. Of course, we do suggest investing your very first skill point into Windrun, in order to enable a quick escape in case you get caught out before the creeps spawn. Better safe than giving up first blood gold and experience to the enemy team, after all. And that’s it, really. Her skill build is actually extremely simplistic, even when playing as a support. Her talents are also fairly straightforward, making her entire skill build even more easy to figure out. Windranger appreciates items that synergize well with Focus Fire, as well as those that allow her to position herself for easy Shackleshots and Powershots. Maelstrom is the perfect pick when it comes to the former, as Focus Fire does activate secondary effects. After all, Maelstrom benefits immensely from higher attack speed, since more attacks per second gives more chances for the chain lightning passive to activate. As for the latter, Blink Dagger is the item of choice. Its instant cast animation and long cast range make it great for setting up ganks with Shackleshot. Simply blink to your target in such a way that there is either a tree or another enemy unit behind him, and cast Shackleshot to disable them right away. Follow up with either Powershot or Focus Fire to deal damage, though in the early and mid game you will mostly have to rely on your teammates to do most of the work after the stun. Force Staff also works in this regard, though it is more predictable and has a limited range compared to Blink Dagger. Later on in the game, different paths open up for Windranger when it comes to her inventory. The offlane build benefits most from DPS items, such as Daedalus, Monkey King Bar, and the like. But because she is an intelligence hero, she still gains bonus damage from items like Aghanim’s Scepter, Scythe of Vyse, and even Linken’s Sphere. This means that she doesn’t have to sacrifice too much in terms of utility just to get her damage output up—which is not something that can be said about every hero. Windranger is vulnerable to magic damage, having no built-in source of increased magic resistance and a small health pool. Heroes like Lina, Lion, Venomancer, Tinker, and the like thus do well against her, especially if they manage to get the jump on her. Clockwerk and Axe can get up in Windranger’s face, messing with her positioning game and disabling her through their own means. Clockwerk in particular forces Windranger to buy a Force Staff, just so she can get out of Power Cogs without having to attack them. Remember, though Windranger is the queen of flexible play, she still requires game sense and mechanical skill to play correctly. It is surprisingly easy to turn her into dead weight for your team, especially when the player piloting her doesn’t know how to position properly. Played right, though, and Windranger can be a seriously good piece on your team. The long duration of her disable and coupled with her damage output makes for a surprisingly capable semi-carry, able to tango with most hard carries.